One of the best of these is heading south across the mezzanine level between 700 and 800 Bourke St towards Harbour Esplanade Docklands. The stairs down take you nicely to the toad where you are met by a fence to stop you crossing the road. How about just put a crossing there instead? People just walk around the fence and cross the road now. I can see why they’d do the first two – make the pedestrians walk behind the first car at the intersection (if it’s there!) and the car has clear line of sight to the intersection (which in the first one has a power pole in the way!). If you come from the south along Hampshire Rd to Sunshine Station, the preferred route through the car park entrance (marked by zebra crossings, but not direct) isn’t really used by anyone! Thanks for writing about something that I witness almost everyday and, like you, wonder how dumb the authorities are! 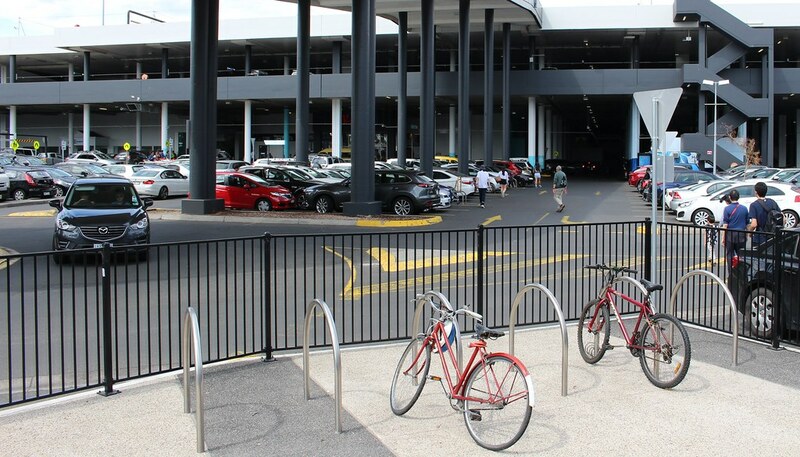 To their credit, some parts of Southland carpark have been modified to make it a more logical choice for pedestrians to walk on designated crossings – installing fences for one thing. My understanding is that it’s often driven by safety guidelines – eg given the speed of cars through a particular intersection, sight lines for drivers, etc, it’s unsafe for peds to cross right next to the corner, so they set the crossing back a few feet. However, given that desire lines show high rates of non-compliance, this isn’t really improving safety at all. If the intersection design is unsafe, sending pedestrians on a roundabout trip isn’t the answer – redesigning the intersection is. Road safety in Victoria is about putting in engineering guidelines, enforcing them, and then blaming pedestrians when they get hurt. @Ben, but some of these changes totally mess up the sight lines. Moving the crossing point away from the intersection means pedestrians may not be able to see approaching turning cars, and the drivers of the turning cars (who legally should give way at a T-junction) can’t see the pedestrians! Oh, and the rough bluestone may slow down cars, but as some on Twitter are pointing out, it also plays havoc with bicycles. This is done for safety as mentioned above. They re-did Chapel Road and South Road a few years ago and moved the pedestrian crossing as per above photos after it was a straight cross over. This means pedestrians have some safety and avoid being knocked over by cars turning in and cars turning out who would only be looking at other cars (not pedestrians). Bad design is evident everywhere however. I have seen so many examples. 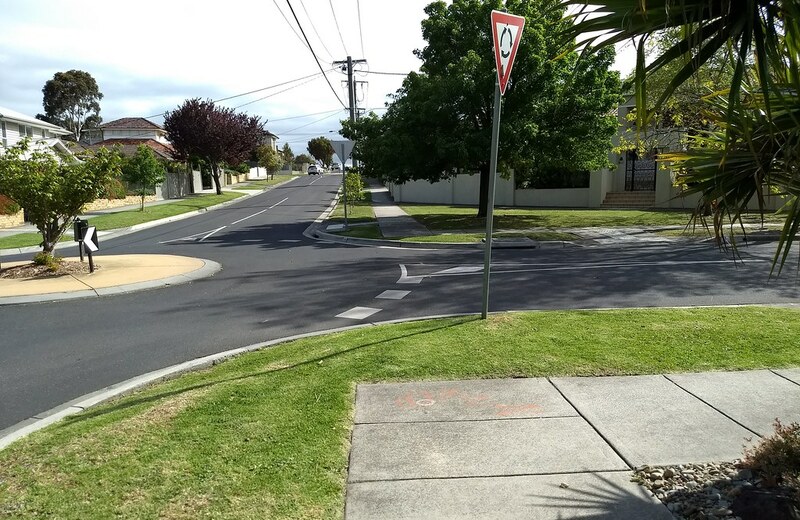 Below our building we wanted a couple of pavement crossing points in the nature strip to stop grass wear and damage but council would not agree initially as they thought they would be tacitly supporting people crossing the where there was not a crossing. They eventually relented and put in two asphalt crossing points, except for weeks one has been blocked my a massive Harley Davidson parked on it. I so want to push it over into the gutter. Was it Berkley University in California where they did not put in paths until they saw where people walked but it doesn’t have to be that hard. People will take the shortest and easiest path and it is perfectly predictable. @Tim for a suburb supposedly designed around foot traffic and public transport, Docklands has quite a few examples of strikingly poor footpath layout, and arguably some of the least pedestrian-friendly traffic light cycles in central Melbourne. Most intersections require use of the “beg button”, and it’s fairly common to see fed up pedestrians crossing against the lights after a long wait. I walked on the Djerring Trail past Galbally Reserve this week and there’s a huge existing kink that doesn’t look like it’ll be straightened (hope I’m wrong), so a short trek through the dirt rather than spend all day there. Some signage issues too e.g. no clear directions where the path goes eastbound past Murrumbeena – I ended up in the car park before making my way back to the main path. Hopefully the path around Oakleigh will be better once they finish the removal of the original Platform 1. Also looked like somebody had had enough of selfish people parking in the eastern-most car park at Oakleigh (soon to finally have a bollard) and ripped off their left mirror(!). 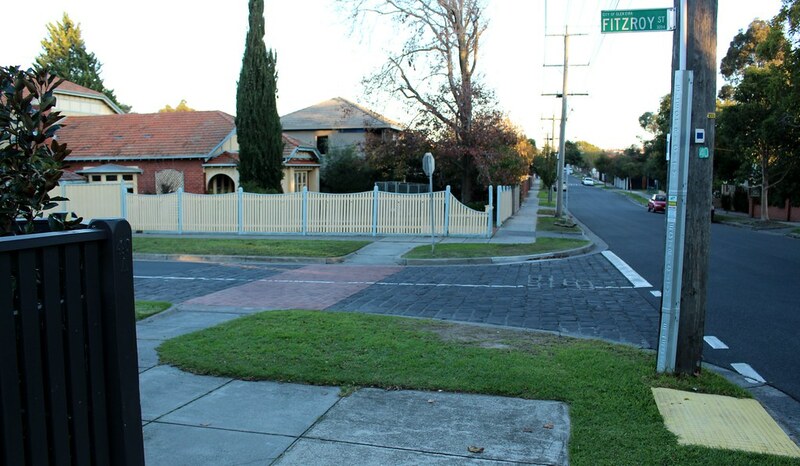 One of my pet hates – if a road is temporarily blocked to vehicles it’s usually published by Vicroads, Google maps etc., but if a path is blocked temporarily to pedestrians you often only find out when you get there (and have to quickly find an alternate route, which isn’t always intuitive). All this is symptomatic that if you’re a pedestrian, you mustn’t be in any hurry and are happy to meander because you don’t have a particular destination or desired time of arrival in mind. 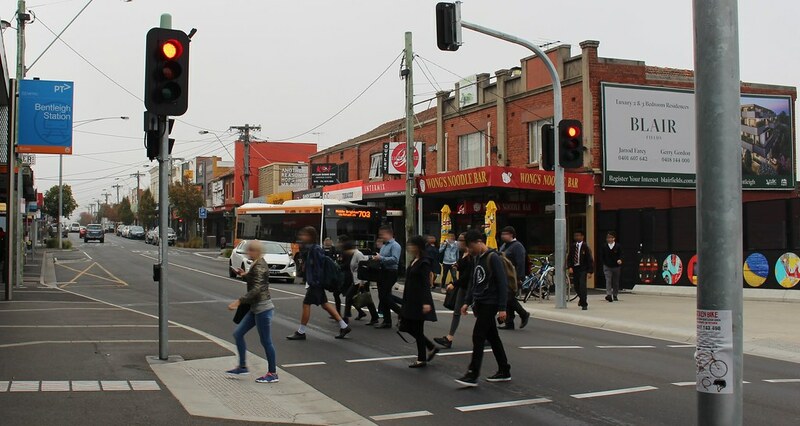 Same thing at Ringwood, they removed a signalised crossing right outside Eastland in Ringwood St during its redevelopment so they could move it 100m south to link up the derelict Midway Arcade with a shortcut to Costco. Speaking of Costco, another one of these offset crossings (without signals) is around the back of the building in Market St, and more recently across the road at Charter St (which coincided with a footpath actually being built on that side, shock horror – Bond St still lacks a footpath on the south side beyond Churchill St, and cars, trucks, vans, 4WDs and RVs all use the nature strip as a parking lot). Ringwood is Car City by name and nature. 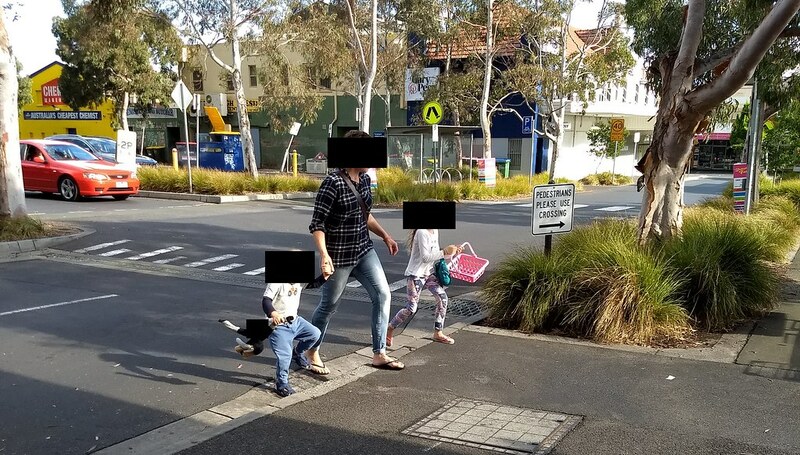 On the west side of Ringwood St opposite Eastland, you will even come across a pedestrian crossing on the footpath itself. As in, you have to press the beg button to continue walking on the same footpath because cars apparently have the right of way when coming out of an underground carpark on private property and stopping on the footpath (I think it’s the MEGT building or somewhere around there). Of course it should be of no surprise that it defaults to a red man and comes with a 90 (or 120?) second wait for the next phase, although no-one even looks at it because its existence is completely pointless and cars are rarely there, and after hours the carpark is locked anyway. I would question the legality of having a crossing on a pedestrian right of way, but I assume it’s 100% legal according to VicRoads and its cronies in Spring Street and that if caught walking past the completely useless red man in a jaywalking blitz I would most certainly be fined for walking on the footpath against a red man because Victoria (the same state that also allows motorcycles to park on the footpath). The carpark does not have its own road (unlike Eastland’s signalised carpark entrance on the other side), the cars simply drive up and over the footpath like a normal driveway yet for some reason this one property is apparently allowed to have 24/7 vehicular priority over people walking. That Ringwood situation where you have to ‘cross’ while still on the footpath is caused by Eastland taking over a road and turning it into a car park. Legally, you are probably still ‘crossing’ that road, which is quite convenient for the car-centric Eastland development. The former road is the one that used to contain all the bus stops and make Eastland a useful bus interchange. Those bus stops have mostly been moved into the Ringwood station, but the 742 has been turfed out onto Ringwood Street. It’s pathetic. Actually I was wrong – I misread and was referring to the east side of the street. The 742 should have been moved to Ringwood station when all the other buses were diverted from what used to be Plaza Centre Way. I always thought that it was just plain old bus rivalry why Ventura refused to connect to the station next to Invicta and National (or The Met/MMTB and whoever ran the 2xx/3xx buses 30+ years ago), despite Ventura at one stage having a complete monopoly over Ringwood (when they took over Invicta, Grenda and National, including the 901). With Bond St being only a three minute walk from Maroondah Highway there isn’t even any point in the 742 going around there – the traffic all rat-running along the Bond/New St stretch is atrocious too, caused by the lack of a No Right Turn rule at the Eastland end (a relic from when Bond/New really was the Ringwood Bypass, as the western end was the last to be built due to Eastlink). All Bond/New St does these days is cause delays to the 742, which then adds to the timetable; no wonder only every second bus heads east of Heatherdale at some times (leaving 40 to 60 minute gaps in peak!!!) It might have been different in the old days of the Ringwood Market and Eastland in 1988 (the year Eastland became a proper shopping centre instead of just having Myer and a couple of other shops), but today’s Bond St is nothing more than a semi-residential/industrial street with no amenities whatsoever, any foot traffic is merely to and from Ringwood Square, Costco or Centrelink (of course Ringwood has a Centrelink! Feel free to insert the obligatory bogan/junkie quips here). Speaking of desire lines, I found yet another one nearby on the Eastlink trail. As soon as you divert from Molan St towards Canterbury Rd there is a connection back to Maroondah Hwy yet no direct path to the south. Cue the worn grass connecting both paths. There is yet another one on the Eastlink Trail half way down the hill towards Canterbury Rd, it “connects” to Palmerston Rd East, with the connection cut off by nothing more than a chain fence (the footpath goes right up to the trail) which has been vandalised with bolt cutters several times by people from the southern New St area who clearly don’t want to take an 800 metre diversion to and from Molan St or the equally long way via Maidstone St and Canterbury Rd. Of course, said fence is always repaired ASAP as that is apparently cheaper to repair it hundreds of times than removing it completely to add another connection to the trail where almost no work even needs to be done. It might not count as one, but I will also point out about a kilometre of “desire line” called the Ringwood to Box Hill rail trail. The section between Ringwood and Heatherdale (heading towards the city) ends abruptly at Eastlink, and then forces people to take a 200m deviation along the Eastlink Trail, under the Molan St road bridge, around in a wide, lightly-graded, DDA-compliant circle to exit at Molan St (also note yet another desire line in the grass right next to the bridge because people don’t want to travel in circles), and then heading over the same bridge, crossing the street at grade near Heatherdale, through the Heatherdale carpark entrance, continuing up the hill next to the station and then crossing at grade again on Heatherdale Rd. Let me guess, ConnectEast said no to blocking the single Maroondah Hwy-Canterbury Rd toll section over a weekend (oh no, people might have to cram onto the now grade-separated Heatherdale Rd for a few days) so the government followed the road giant like sheep. Who calls the shots in Victoria, the state government or the road corporations? This is a great illustration of why Human Centred Design – understanding people and their goals, needs + wants, behaviours and motivations, is the best way to design things that humans need to use. Surprisingly, in all domains, engineers and the people who build things often think they know best and fail to take the time to evaluate their proposed ideas and solutions with the people who’ll be using them. Often times designers ‘design’ things that look great, but fail to understand the people they’re designing for. Public transportation could do with a huge dose of HCD. Whether it’s station design, vehicle/rolling stock design, signage, information displays, kiosks, mobile apps or websites. PTV has no human centred designers employed (or “UX designers” as more commonly known in the digital domain). Car drivers that are turning into a different street, are supposed to give way to people who are crossing the street which the car driver is entering. Moving the place where pedestrians are supposed to cross, 5 or 10 metres away from the intersection, probable allows car drivers ( and their compulsory 3rd party accident insurers ) to avoid that responsibility.